Kaneuji (兼氏) was born in the late 13th century in the Yamato area. Around the Geno Era (1319-1321), the latter part of the Kamakura period, Kaneuji (兼氏) left Yamato and moved to Taki-gun Shizu. 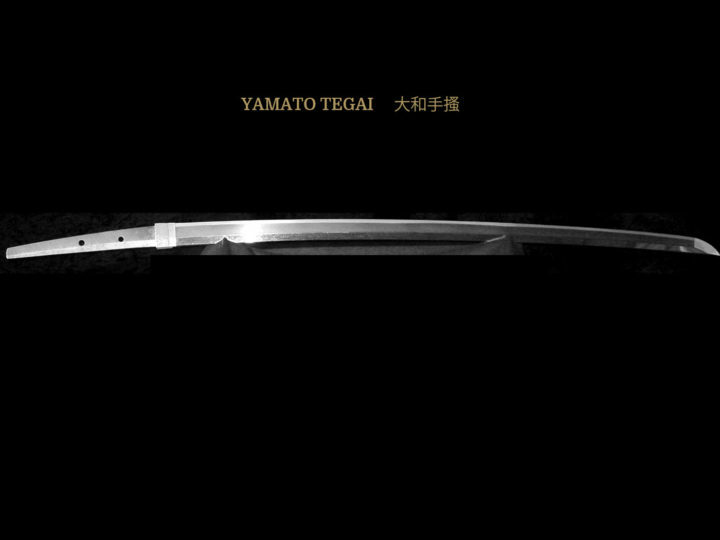 Prior to this point he is considered to have been a master smith of the Yamato Tegai School. Around the time of his move to Shizu (志津) in Mino Prefecture, he spent some time as a student of Masamune (正宗) of the Soshu School. In fact, Kaneuji (兼氏) is considered to be one of the ten famous students of Masamune (正宗). Returning to Mino after his studies with Masamune (正宗), we find a marked transformation in his sword making. He dropped most of the Yamato characteristics and adopted a strong Soshu influence in his workmanship. He soon developed his own style of forging that while it contained a strong Sôshû influence, it also retained some small amount of Yamato traits and, more importantly, contained characteristics of his own. His workmanship shows more of the Sôshû influence than the Mino traditions since the Mino tradition was still in its developmental stage. Kaneuji (兼氏) is considered to have been the founder of the Mino den, the last of the five major schools of the Koto period. The Mino tradition continued to evolve with the students of Kaneuji (兼氏). These students of the Naoe-Shizu (直江志津) school developed a sugata that is grander than that of Kaneuji (兼氏). 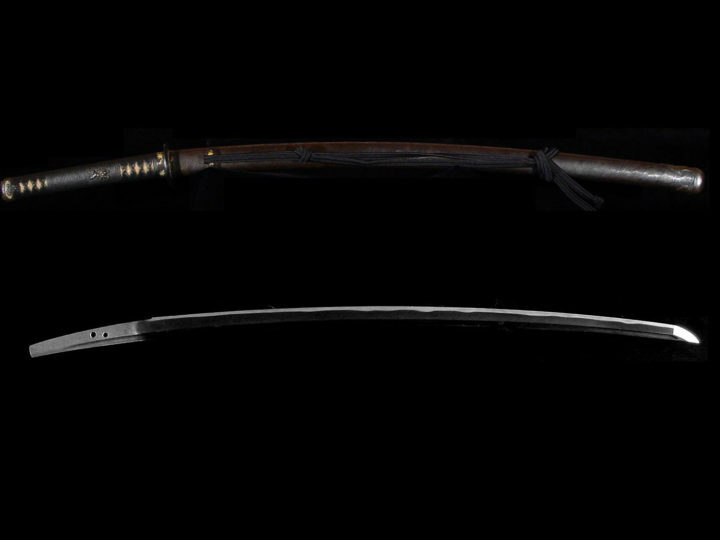 The jihada has more masame combined within it, the jigane is whitish, and the hamon is mixed with considerable togare gunome. The works of Kaneuji (兼氏) can be broken down into several categories depending on where he was living and studying. His earliest works are thought to have been signed with these kanji, 包氏, and were done in pure Yamato Tegai workmanship. Unfortunately, no works remain with this signature. Upon moving to Shizu (志津), he changed the first character “Kane” from 包 to 兼 thus using the form of the character that we today call the “Mino Kane”. There is a signed tachi that once belonged to the Ikeda family in Otsuka that is done in the Yamato style of workmanship with the signature (兼氏). Unfortunately, since Kanuji (兼氏) worked during a time when very long swords were the norm, today we have mostly o-suriage mumei tachi. There are enough zaimei tachi, however, to allow sword scholars ample material to form solid opinions as to the changing work styles of Kaneuji (兼氏). Also, a good number of signed tanto survive to further support this research. I would like to make a short digression to clarify the terms Shizu (志津) and Naoe Shizu (直江志津). After leaving Yamato, Kaneuji (兼氏) moved to Mino and settled down in Shizu (志津). Hence we often refer to him simply as Shizu (志津). In all cases when we are using the term Shizu (志津), we are talking about Shodai Shizu Saburo Kaneuji（志津三郎兼氏). In later times the students of Kaneuji (兼氏) moved from Shizu (志津) to Naoe (直江) that is also in Mino. 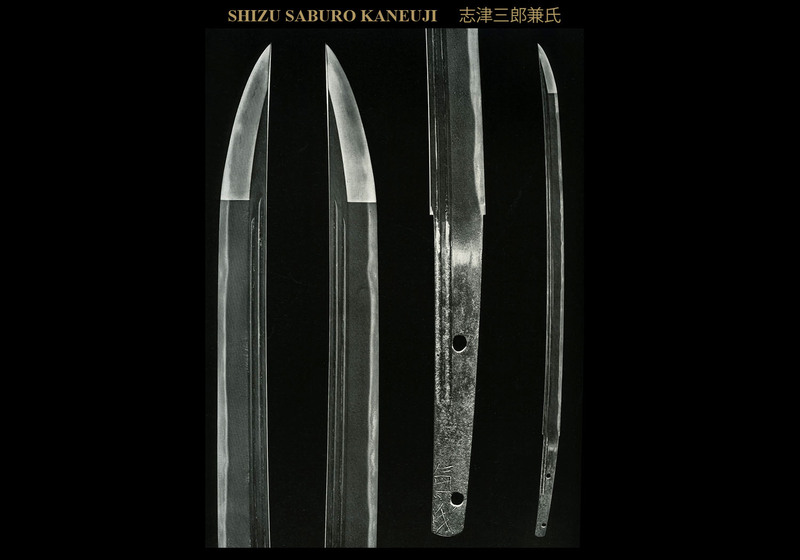 Hence when we speak of a blade being a Naoe Shizu (直江志津) blade, we are referring to a blade made by one of the students of Kaneuji (兼氏), but never by Kaneuji (兼氏) himself. SUGATA: Kaneuji (兼氏) worked from the end of the Kamakura era into the beginning of the Nanbokuchô era. Hence his early blades tend to be of standard Kamakura sugata with a mihaba that is not very wide and a kissaki that is generally slightly large (chu-kissaki). The sori will be shallow torii sori with little funbari. 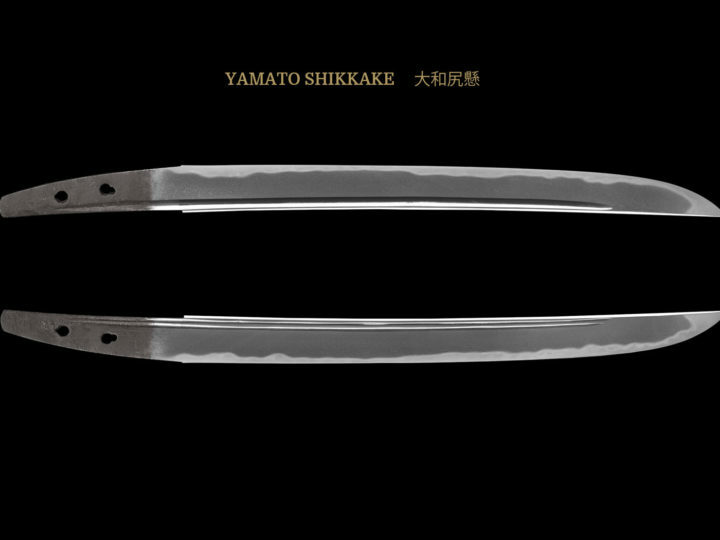 His later blades that are mostly suriage are typical of the Nanbokuchô era with a wide mihaba and an o-kissaki. His tantô are generally small sized, with uchizori, musori, or sotozori. Tachi and katana are all iori mune except those in katakiriba shape, which are mitsu mune. Tantô are mostly mitsu mune. JITETSU: His hada will be a finely worked ko-mokume mixed with areas of o-hada and itame hada. There will also be a trace of masame hada in his blades especially in the shinogi-ji. There will be chikei, abundant nie and occasionally coarse nie. The color of the steel is clear appearing blackish rather than whitish, as does the later Mino tradition. HAMON: The hamon is done in nie deki with either gunome or notare as the main theme, with a mixture of both as most common. 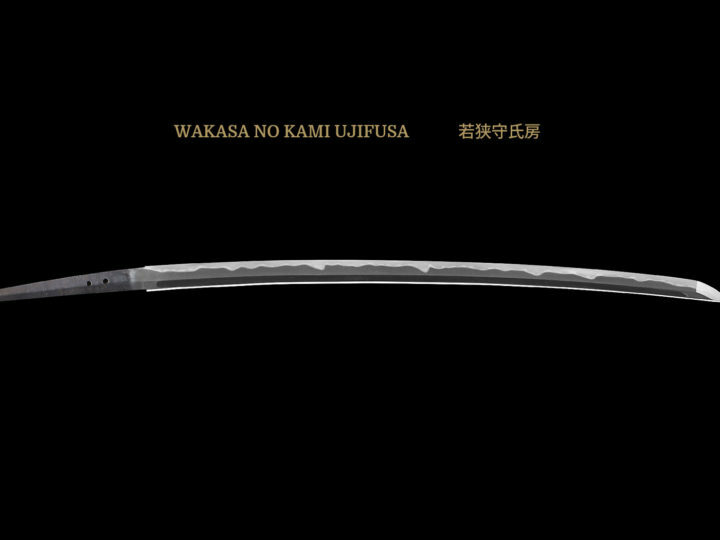 The width of the hamon will vary but will always have thick nioi, abundant nie that is often kuzure, inazuma and kinsuji. These combine to make the hamon very much alive. The overall feeling of the hamon will be that of the Sôshû tradition but differing from it in that togari-ba is usually found somewhere. BÔSHI: Generally, midare komi is shape ending with a slight kaeri or yakizumi. The top of the bôshi will be ko-maru except on his katakiriba pieces where it becomes slightly o-maru. There is usually a bit of hakkake in his bôshi. HORIMONO: There are bo-hi and futatsuji-hi in his katana and tachi. There are tantô with suken on the omote and koshibi on the ura. NAKAGO: I do not believe that and genuine tachi with an ubu nakago exist. In tantô there are some that are musori and some that have a hint of furisode. The saki in both is ha-agari kurijiri. The yasuri is a shallow katte sagari. MEI: He used the two character mei Kaneuji (兼氏). On tantô it is located directly below the mekugi ana. It appears to be fairly small on swords from his early period, and larger on those of his later period.